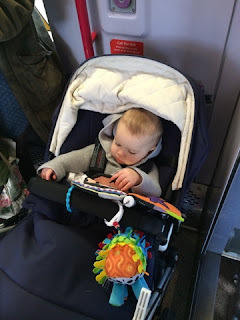 Arthurwears: Outcast on our train journey - mums and babies - is this fair? Outcast on our train journey - mums and babies - is this fair? Today I decided to take Arthur on a train journey into Leeds to meet a friend. Although he is 9 months old, this is only the third time I have actually done this, mainly because my last experience left me in a situation where I had to leave Arthur on the platform and board the train to ask for some help from a fellow passenger ( a school boy!) in getting the pushchair onto the train. We almost didn't make it as the conductor started to shut the doors. The station where I board the train has not only a HUGE gap between the train and the platform, but also a noticeable height difference making it impossible for some to walk onto the train, let alone board the train with a buggy/pushchair without help. 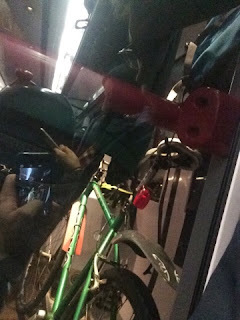 We managed to get onto the (relatively quiet at this point) train ( again with help from a fellow passenger) and I sat in a single 'parent with children' (or for the elderly) seat and put the pushchair right up against the screen as can be seen in the photo above. We went through a couple of stops and people got on and off the train no problem. Arthur loved looking out the door windows and waving to people as they got on and off. As if this wasn't embarrassing enough, the conductor then told me (with a smile on his face) that I need to go and sit in the disabled area where there is 'a big space for pushchairs' in the next carriage, along with any other mums. I told the conductor that I could not wheel the pushchair down the aisle to the next carriage, it is too narrow. He said "No, get off the train, walk down the platform and get back on". ...There was no space for the parents to sit down, and I had to stand in the doorway of this area. 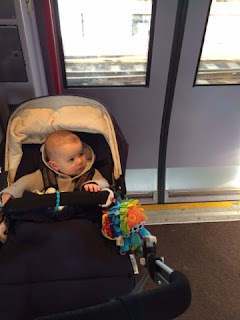 I am sure that I don't need to go into detail to other mums reading this post as to why being forced to stand on a moving train just weeks, or months after giving birth is completely unacceptable and quite uncomfortable for some mums - especially when there are plenty of free seats available elsewhere in the train. But stand we did, crammed into a smelly toilet area like naughty school children with our beautiful, unaware children, wondering just what the hell was going on. The conductor came back and told us all that we were a 'fire hazard' with our pushchairs near the other doors and that for this reason we HAD to come to this area instead. He reminded us that when we get the train back home, we must look out for the disabled signs on the doors and board the train there so that we can put our pushchairs in this area. If there were a fire, or any other emergency, we mothers and fathers with our precious cargo would certainly perish, for we were packed in so tightly it was impossible to escape without lots of jiggling and maneuvering around in advance of any anticipated alightment. I have been on this train at other busier times (and therefore more dangerous times in terms of fire safety) and there has been no issue at all with passengers being crammed into the entrance and exit areas like tinned sardines. 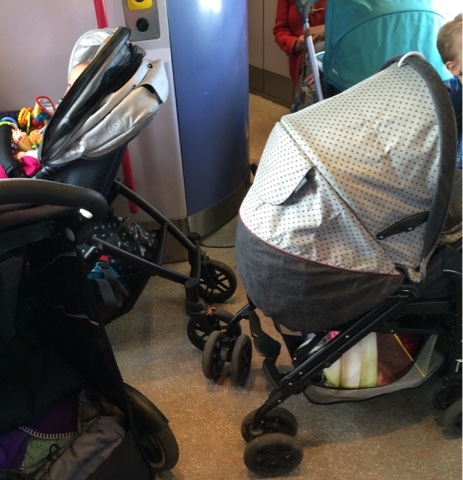 Other passengers were unable to access the toilet facilities ( or carriages beyond) because of our prams. If a passenger in a wheelchair had boarded the train there would have been nowhere for them to go. I paid almost £6 (off peak) for my ticket - I'd quite like to sit down, instead of putting myself at risk of falling over in a doorway, on top of my child. 30 Minutes after getting off the train we finally made it out of the station! On the way home I did get on the train via the disabled doors to place Arthur and myself in the designated area as instructed this morning. I found a young woman in a wheelchair sitting there, waiting to get off the train. A conductor shouted down the train to her that he hadn't forgotten and he would get the ramp shortly. She looked at me and said that "we are made to feel like outcasts" in the smelly toilet area. Have you had a similar experience?? 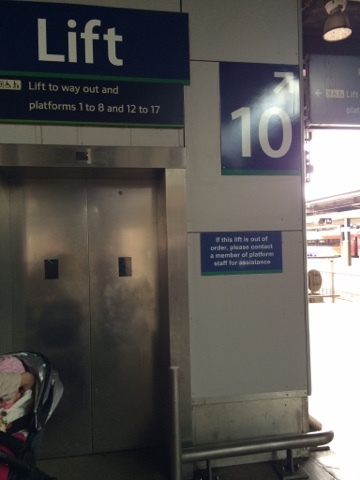 Did you know about this rule that mothers with babies on trains should be places in the disabled area? Do you agree that for mums, dads, babies, disabled passengers, this simply isn't acceptable? I'd love to know your thoughts in the comments below. 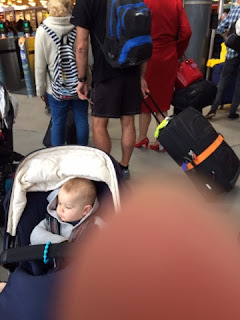 "I am sorry to learn that you have experienced difficulties whilst travelling with a pram. Our trains whilst being large vehicles do have limited accommodation for bulky items. We are dependent on our customers to co-operate with each other and ourselves in using the available space to best effect. This means that we have to place limits on the items that we can carry. These limits cover weight and size etc. In respect of prams and pushchairs we would expect that they are folded whilst on the train. There may of course be times off-peak when a conductor may exercise discretion. If a pram or pushchair is not capable of folding and the conductor believes that its carriage may cause inconvenience or nuisance to other passengers, delay the train or impact on of the safety of the train they have the authority to decline travel I can only apologise if this was not carried out in a polite and courteous manner. I have passed your comments to the Information Manager, for future consideration, as I agree it would be most helpful to anyone travelling with a pram or pushchair to know of the conditions. I hope you can appreciate our position regarding this issue, however I am sorry if you remain disappointed with this policy"
We had a bad experience the other week on a train from ilkley. We sat in a single seat on a very quiet train. After 3 stops where passengers has managed to fit past the.pushchair with no problem the conductor came marching down the train and rudely told me I had to move as I was blocking the Isle. He did this in a very rude and abrupt manner and I felt very embarrassed. A lady even commented after he left how rude he had been. Getting if the train my worst nightmare happened when the front wheels of the pushchair slipped down the huge gap between the platform and the train. Only when I shouted for help did the train driver and a fellow passenger came to help. I was in floods of tears. It has put me off getting the train on my own. That's really bad. There are zero allowances made here in Thailand for buggies or people in wheelchairs. We never use our buggy unless we are going to a mall and parking there as all the pavements are barely passable as a pedestrian. Even in my nice, gated community the pavements are blocked with trees, shrubs, holes and other obstacles. Train toilets are grim, not nice that you're made to stand in there and you're right, I'd think it would be more of a fire risk.